Though we thought little of the Civic, we were surprised by the Corolla (which is much of the motivation for creating Corolland). If you want a comfortable little car, the Corolla just blows away pretty much anything near its price range, and it provides decent performance too - especially with the five-speed. There are three Corolla models: CE (cheap), VE (value), LE (luxury). They all have the same engine, but as you move up you get more options built in and more available. There is a value package for each which is free and seems to be included on every car; on the LE, this means a heavy-duty weather package and cruise control. The Corolla's styling is unobtrusive. It looks small and quiet. With a five-speed transmission, it gets 31 to 38 mpg (our test: 35; should be slightly higher on 2000 and later models due to variable valve timing). So why is it so much fun? I think part of it comes from the lack of acceleration lag; the power is steady from idle to redline, with little if any hesitation (on 2000 and later models, power increased 5 hp, and more torque was available at lower speeds). On the road, the Corolla is nimble, and tempts you to do things you really shouldn't. Though it tends to wander on the freeway, replacing its standard tires (Goodyear Integrity!) with good ones, such as 195/60 Bridgestone Potenze RE930s, substantially improves handling (especially on wet roads). In fact, a Corolla with very good tires is probably a handling match for a base model Neon, at least in turning - if not in highway stability, where the Neon's excellent suspension shows its acumen. One area where the Corolla is clearly ahead is in the ease of driving, and the comfort level of driving. There is no tip-in; it's easy to make smooth shifts. Why get an automatic? It's quiet inside. Not much engine noise comes through; like bumps in the road, it's very muffled. There is wind noise at higher speeds, but on the whole it feels much quieter than its competitors. The ride is a pleasant cross between luxury and sport, which means you can feel the road but you aren't jarred by it. The headlights are automatic, and it has daytime running lights that use the brights - not a good system. The headlights are powerful and well focused. Interior lighting is also automatic and is logically designed. You can unlock the electric doors from the outside, and whenever you unlock the door the interior lights come on. They go back off again when you start the ignition, after you've stopped the engine, when you shut the door. There is a ring around the ignition switch which lights up when you open the doors. However, the power window lockout oddly prevents the driver from operating any power window but his own. Trunk space is on par with competitors, but the 70/30 fold-down seats allow you to put in a child seat without losing the fold-down seats. If you can buy one, the built-in child seat also comes with a 70/30 fold-down seat! The radio is substandard. Unlike the Prizm's Delco unit, the Corolla's stereo looks like someone bought it at a local store. The sound is not up to the standards of most other cars. The combination tape buttons, presets, and CD controls (even if you don't get a CD player) are confusing and hard to read. After having the car for a while, you can get used to these, but the sound quality may be an issue to long-term owners. The interior seems slightly smaller in back, but roomy enough for most people (people outside the US generally buy cars this size). There are some useful places to store things, though the armrest-compartment is too far back to use while driving, and the cupholders are impractical for most cups and rather flimsy. The coinholder only holds a few coins, which rattle as you drive. The moonroof is set too far back to be seen while driving, but the controls are good. And do you think Toyota could have afforded a lighted glove compartment? Or a hood light? Or instructions on using the jack in the trunk? Or good tires? The trunk is decently sized, and we appreciate the remove seat releases which allow you to push the rear seats forward without much effort. However, access to the spare tire or jack (or whatever tools you store with them) requires the removal of a large cardboard piece, which in turn requires the removal of every single item from the trunk. 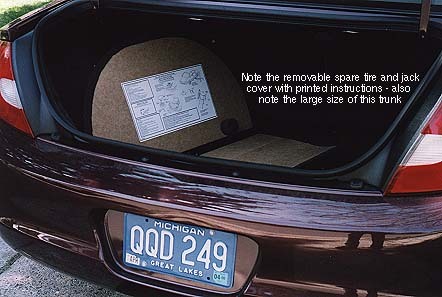 Chrysler shapes the trunk so a small piece of cardboard sits right over the spare tire area, so that you merely need to move the carpet out of the way, then remove a single small piece of cardboard (which has the tire replacement instruction pasted on the back). Thus, you can leave the trunk half full and still change a tire. If it seems like we're being critical, it's because this is pretty much the extent of our criticism. We loved this car, from its side airbags to its (impossible to buy without special order) child seat to its nice ride. That brings us to the next problem. This is lovable car despite its lack of personality. It was a joy to drive back and forth on our 55-mile-each-way commute, and it was also a joy to fill the tank so rarely and so cheaply. The car feels solid and sturdy, and free of noises and rattles. So what's the problem? Price. The Neon is heavily discounted, and Chrysler still makes money off it. You can get a Neon equipped the way our Corolla was for thousands less, with similar build quality. Is it worth the price? You have to decide for yourself. Toyotas usually do well at resale time. Over the long run, the price difference might be quite small. If you have the money, it's worth driving the Corolla before you buy a Neon. The Chevrolet Prizm and most US Corollas are built in the GM/Toyota joint venture NUMMI factory in California. It has gone from being a rather poor GM factory to one of the highest-quality facilities you can find, thanks mainly to Toyota's management expertise and the many employee suggestions which were made and implemented. Other Corollas are built in Ontario. The 2003-2008 Corolla takes the 2002 package and essentially counters most of its shortfalls. It's bigger inside - with considerably more rear legroom - and a bit wider, so the front seats are farther apart. It's also taller, and is now larger than the Honda Civic. We expect (based on past results and Honda's currently-low build quality on the Civic) that it will also be much higher quality. Currently, the Corolla is, according to that big "independent" magazine, the second best made small car in America, right after the Toyota Echo (third place is the Chrysler PT Cruiser; Honda Civic's far down the list). Handling has been improved quite a bit, with modern new shocks that tighten up more as they reach full compression, and road stability is higher. Making the Corolla even more attractive are additional standard features and better brakes. Did we mention it's larger, gets better gas mileage, and has just a little more horsepower? The three-speed automatic has been dropped, as well. You can't get a better automatic-transmission small car. Car review: 2004 Toyota Corolla. When the Neon came out, it was scrappy and cute, with performance that beat everyone in its price class (including on the race track) and a personality that you either loved or hated. By 1999, the Neon had managed to garner a terrible reputation for reliability, thanks to many problems with models built from 1994 to 1996, troublesome frameless windows, and head gasket failure through late 1997. The second generation addressed these problems, while adding space, comfort, and sophistication. Quality rose dramatically, though not up to Corolla standards. Acceleration. In everyday use, we'd say there's an even match — if both cars have manual transmissions. Under hard acceleration the Neon is faster, but generally the Corolla feels the same. The automatic transmission killed the Neon’s responsiveness, at least until the 2003 models. Gas mileage. The Corolla has an edge where gasoline is expensive or people care about pollution. We found the 1999 Corolla to be good for an extra 2 mpg at least. 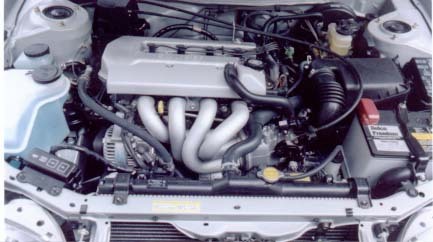 The 2000 and later models have even better mileage due to variable valve timing. Handling. Unquestionably superior in the Neon. No loss of traction at all when accelerating from first, even when turning at the same time; no screeching of tires under hard and fast turns. While the Corolla tends to be unstable in windy or high-speed conditions, the Neon is unfazed at all speeds (within its speed limiter) and under high winds. The Corolla also has a hard time with accelerating on turns; the front tires quickly lose grip. Space. Neon has a much larger trunk, and the pass-through is also larger. 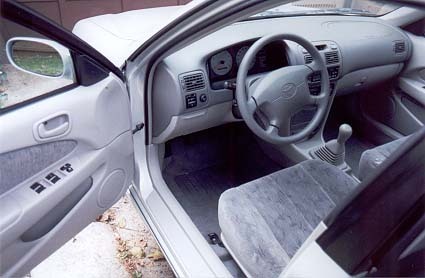 The Neon's interior has more space in front and back. Lighting. The Neon lets you control when the headlights go on, instead of automatically turning them on every time a cloud passes. Both do convenient things with the interior lights when you get in the car or take the key out. Corolla has goofy radio controls and no lighting package even on top models. Neon does not have a standard trunk or gas cap release. Ventilation. The Corolla needs air conditioning even on mild days, but the Neon gets that air flowing nicely. Oddly enough, the Corolla also seems to be the only car sold nowadays without side window de-misters; you have to manually point the vents at the windows to defrost them. Then again, the Corolla is also oddly lacking in such niceties as an underhood and glove box light. The Neon has extremely powerful air conditioning, and the Corolla...doesn't. Safety. Both have the second-generation airbags. Corolla can be ordered with side airbags, too. 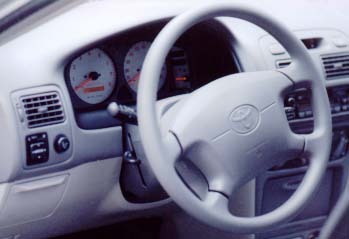 Neons had optional integrated child seats which were listed as available on the Corolla, but quickly removed from availability. Price. Now that all Neons are used, they are far cheaper than Corollas. Noise. Similar until you get over 60 mph - then the Neon's engine, revving high, starts to make itself known. Generally, the Corolla's engine is quiet and well-mannered, while the Neon's is more raucous. Overall. The Neon feels sportier and the Corolla feels more refined, though part of that is the sitting position and part is the quieter engine. The Corolla is superior if you want a nice, well-mannered, quiet car and don't mind paying extra for a Toyota. The Neon is superior if you want a sporty car, or better handling, braking, or acceleration, more room, or a considerably lower price tag. Both are far ahead of the other small cars on the market, and neither is a mistake to buy, unless you care more about reputation than reality.